Blooms May-June, with distinctive white bracts surrounding small, greenish-yellow flowers. Features dark green leaves that are long and elliptic-ovate in shape. Full sun and partial shade are best for this tree. 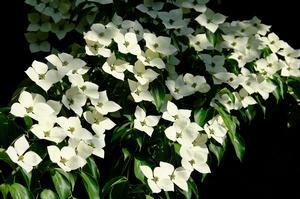 The Kousa Dogwood grows in acidic, loamy, moist, sandy, well-drained and clay soils. It prefers average moisture but is somewhat drought-resistant.